A 30 year cake decorating veteran that doesn't often decorate cakes anymore, I am a charter member of the St. Louis (Missouri) Metropolitan Sugar Art Guild. We meet four times each year for discussion, demos, etc. The membership consists of decorators of all levels beginners to advanced, amateur to professional. One event we participate in is a holiday celebration at the Missouri Botanical Garden. Whoever wishes can make a gingerbread display for the patrons to enjoy as they enjoy caroling, before they stroll through the gardens or visit with Santa. My display this year was inspired by the many 100 calorie snack packs available. I told myself I could not use more than one pack of any type. This resulted in the row house concept, to allow the variety. I really enjoyed this project. There is not more than 100 calories of any item, including peppermint sticks, other than royal icing and probably the fondant snowflakes. Now what do I do with this two foot square monster? I hope you enjoy it. There is a small fondant train and a gingerbread rocking horse around the indoor tree not seen in the photo. Hoping that you will be participating this year. What an exceptional piece of art. Thank you for sharing you gift. 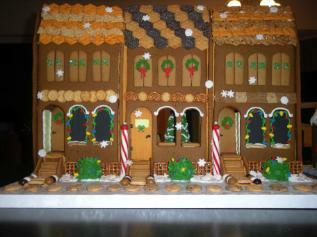 On our anual visit to the Garsen, we walked past the gingerbread displays. This one was one of our favorates. I hope more of the ones there get their pictures posted here. We also liked the Train and The Nightmare Before Christmas ones. Good idea to use snack packs. Will try that next christmas. Absolutely stunning! I will look at this picture again nearer Christmas next year to inspire me to do my second Gingerbread House!